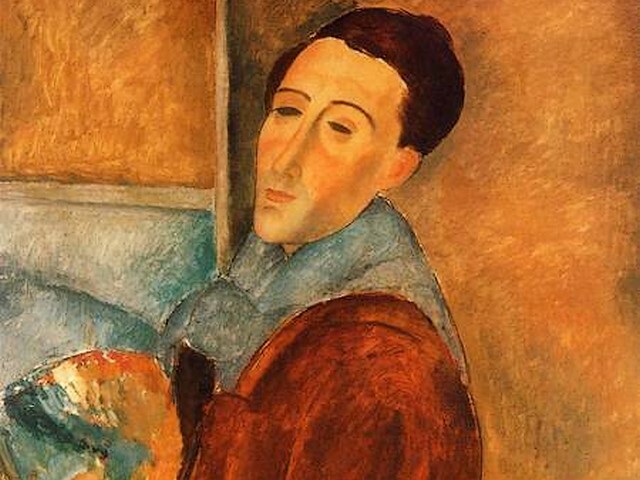 A fragment of 'Self Portrait' by Amedeo Modigliani (1919, oil on canvas, Museum of Contemporary Art, Sao Paulo, Brazil), the last work of Modigliani, which he painted just a week before his death, with half-shut eyes and a palette in hand, as though with a presentiment of the end. Amedeo Clemente Modigliani was born into a Jewish family at Livorno, in Tuscany, Italy on July 12, 1884 and died in Paris of a tubercular meningitis on January 24, 1920. He is an Italian artist who worked mainly in France, known for his paintings and sculptures in a modern style with elongated form and of mask-like faces.